Personally, I would have enjoyed seeing more of the actual wedding, especially considering how much airtime was focused on the two days leading up to the big event, but that's neither here nor there. I also would have appreciated more callbacks to earlier jokes, though I did enjoy "Major Pleasure," the return of the Cockamouse, and Marshall's obsession with mythical creatures. I was amongst those who believed that the mother was going to die, so that wasn't a shocker, and i had also read about the Ted-and-Robin-end-up-together-anyway theory, so that didn't surprise me much, either. However, I found myself crying as the credits rolled for the final time... and it wasn't because I'll miss this show like I still miss ER. It was because, as much as I was prepared for the possibility, I didn't want Ted and Robin to end up together. To me, it kinda negates the series as a whole, though I did have a soft spot for the return of the blue French horn! I'm glad that Barney found happiness in a daughter, and that Robin finally got to be the renown reporter she yearned to become. I smiled as Lily was pregnant for the third time, and as Ted developed into a guy who doesn't want to be out past 10pm. I cringed a little at the idea that it took seven years and two kids for the Mosbys to finally tie the knot, and that they never got their fairy tale wedding, but I smiled as Ted was able to share happiness with someone, and as his kids pointed out just how in love he has been with Robin all these years. This is a series that should not get a reunion of any sort, as it was timely and appropriate and realistic in a way that future generations might not understand. 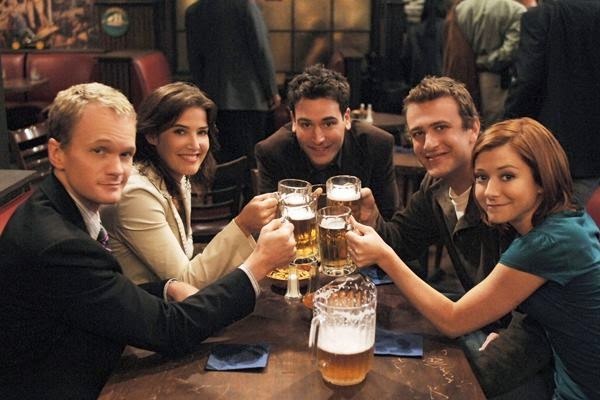 The next time I'm in New York, I will again have a drink in the HIMYM pub, and toast to what the series could have been, while celebrating what it ultimately became: a story woven with adventure and friendship that didn't overstay its welcome but could have been different. By 2018, Marshall becomes a judge in Queens. In 2019, at the annual Robots Vs. Wrestlers event, Barney uses Playbook II to pull off "the perfect month," but the last girl of the month gets pregnant. [I could have watched a few more of the new plays!] Ellie, his daughter, is born in 2020 and immediately captures his heart. At the same time, after seven years and two children, Ted re-proposes to Tracy, and they get married on a Thursday in a small ceremony. [I love that she couldn't wait to say "yes" !! That might have been me had I seen my engagement coming!] Robin attends at the insistence of The Mother, and Barney now yells at scantily-clad young women for drinking before noon. [full circle!] Marshall begins his run for State Supreme Court as well.